Appetite for destruction. – Dirty wet dog , boats and sailing. Yes that really is the end of the bath and the only reason its not completely out is that i have no idea what some of the plumbing underneath it is actually doing. So i have started this years projects with the first stage of ripping out the bathroom and as i write today most of the bath is out, all of the long wall and part of the short wall has been stripped of tiles and plasterboard and part of the ceiling is out too. The bath had to come out in slices because the existing plumbing goes through its mounting legs on some pipe runs and when he took a quick look even the plumber wasn’t sure what its all doing. The shower and the sani-flow toilet are i think on their last legs : we are down to the leanest dribble of just about warm water in the shower and the sani-flow pump is making some very unhappy noises even though i chuck an extra bucket of water down it every day. I never appreciated the volume and weight of stuff like tiles and plaster board thinking that a few rubble sacks would do the job but half way around and i have filled about 20 bags so far and still got 2 walls and most of the ceiling to come out yet. I may have mentioned ‘Don’-ism’s which are the ‘interesting’ decor, design and DIY done by a previous owner and so far the bathroom hasn’t disappointed : so far i have found about 2 different layers of false ceiling and what i think is the lath and plaster original which as can be imagined is a bit crumbly so its all got to come out……replete with bits of dead bird !. I think that when i do the rest of the old ceiling it will be in a dust suit and respirator. I was thinking that compared to doing things inside a boat that this would be easy especially given that i would be working with straight lines and right-angles rather than trying to spile in complex shapes on curved and angled surfaces…..except of course that this is a 160 year old cottage and nothing is quite square, straight or level and was definitely done by eye. Last year our neighbour on one side took his old bathroom out and that turned out to be a cast iron bath that he could only take out in sections with a grinder and diamond blade. Once he got the chunks out i helped a bit by offering to take the old bath off to the tip and i was stunned how heavy each section was : i reckon the whole bath must have been over 300 lbs and i have no idea how they got it up a narrow set of stairs when they put it in. I think we have got everything ordered , most of the kit is coming from a local bathroom store , the skip should be arriving on monday along with the plumber and the sparks. The parts that i ordered online are from a national supplier who seems to do its customer ‘support’ via a call centre in a very far country , if not a distant galaxy with a poor grasp of spoken English. So far we have had 4 different delivery dates promised but the company won’t even commit to a morning/afternoon delivery but expect someone to be there all day to accept the order….i have no idea what planet these people are living on ! The local bathroom shop has been excellent, really friendly and don’t seem at all fazed by my almost daily visits with yet another drawing and more questions. Ah the joys of renovation we, I looked at the plumbing and wondered if the guy who did it had shares in a fittings company, definitely the suit and mask that old plaster is horrible and a few bird and rat poos as well yum ! 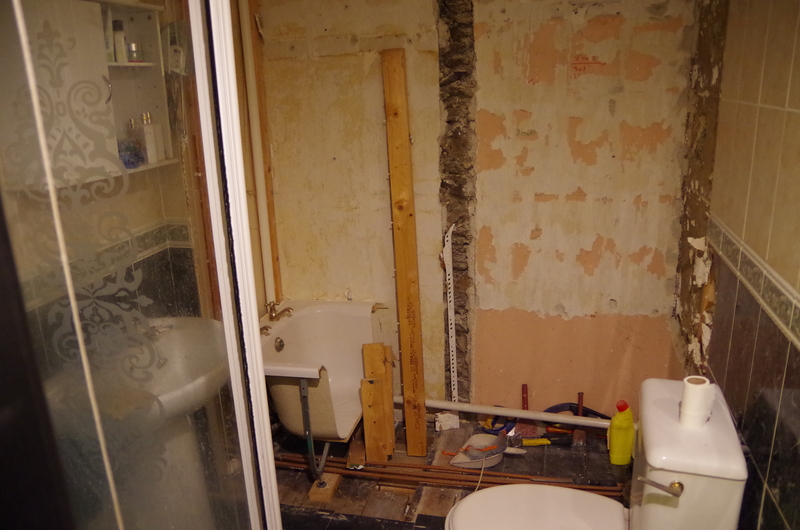 We have to start on the outside of the house here and then the bathroom and a couple of rooms need a refit…. Happy 2018 to you both.